“I notice you apologize a lot,” said a friend the other day. It’s true, I apologize a lot. It comes mostly from a skewed sense of the space I take up in the world or a room or next to someone. I’ve always been painfully aware of my physical presence, at any weight, and have struggled most of my life with feeling physically flawed. Long ago, these feelings manifested into spatial form, and even after years of therapy and despite this weight loss, I sometimes feel unworthy to occupy the space I need to be me. 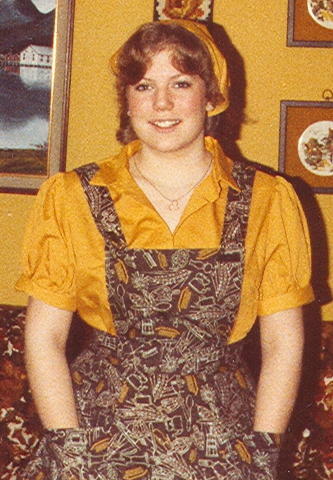 I remember in high school (that’s me in my Country Kitchen uniform, age 16…yikes! ), I did everything I could to hide what I thought was a large body. I stayed as small as I could and walked slightly slumped over and often with my arms wrapped tightly around my books. I rarely wore shoes with a heel. I crossed my legs so my thighs wouldn’t take up as much space wherever I was sitting. I also became easy to sleep with (not in the Biblical sense). When I was young, I somehow unconsciously trained myself to take up as little space as I could in a bed. To this day, I don’t move around much, and I usually wake up in the same position as I fall asleep – on my side in a somewhat fetal position and hugging a pillow close to me to keep my arms from stretching out. If being invisible was possible, most of the time I’d have chosen to be. Even now, particularly in the presence of someone with a strong personality and/or outer beauty. It happened last night when I went to see a friend’s new band perform. While Tony tuned his guitars and plugged in the amps, the singer, Molly, walked up to the bar where I was sitting and ordered a beer. I introduced myself and we chatted for about 15 minutes. A lovely young woman in her late 20s, Molly radiates kindness. She’s also lithe thin; graceful with long arms, long legs, long fingers, and a swanlike neck. As we talked at the bar, I caught myself hunching my shoulders and squeezing my crossed legs tighter together. When I checked in with my body (something mindfulness meditation has taught me to do on the fly), I realized I felt really large sitting next to her and my posture was my way of apologizing. When Molly left to warm up, I checked in with my mind and it was thinking that I, too, have long legs, long arms, and long fingers, but they are attached to unacceptably broad shoulders and broad hips. My neck is thick and susceptible to sagging. Negative upon negative. Apology on top of apology. Rather than be disheartened, though, I got curious. Curious AND, more importantly, non-judgmental. Yes, I still want to be invisible sometimes. I intuitively sleep without moving, shrink into myself when I feel intimidated or weak, and say the words, “I’m sorry” without thinking about why I’m sorry. Also, not running away from the feeling is major. I looked back today on the times I wanted to be invisible in the last three years. Times when it wouldn’t have been prudent for me to run away. This pushing back against the fear started with Oprah. Truly one of the biggest personalities in our culture, right? How in the world did I get through meeting her without begging the earth to swallow me up? I obviously drew from something inside – something I was NOT aware of at the time, but I credit my friend Shari for tapping into. What I learned from that trip above anything else is that a true friend is not afraid to show us how to or demand we pull our heads out of our butts. This personal strength (I’m dubbing it my Super Power) is something I need and want to cultivate to live in the light of day rather than in the shadow of fear. I don’t want to be invisible and I don’t want to physically shrink in the presence of beauty or strength. While I doubt I can change my sleeping habits, I want to fill up my required space and stop apologizing for who I am. I want to feel the aliveness of awareness and take in what strength and beauty has to offer. So here’s to sitting straight, uncrossing my legs, unfolding my arms and embracing something larger and more significant than a pillow. Unless, of course, you don’t agree. Remember, I don’t bite. Leave a comment! This entry was posted in Uncategorized on October 16, 2010 by Lynn Haraldson. It makes me sad to read you minimize your “space” when to me you seem so smart, pretty, and dare I say it skinny. Physically I think you have arrived and your perfect where you are. So heres to no more slumping, etc and apoiligizing unless you've truly done something wrong..You are a role model to so many. Head up shooulders back forward go!! I say I'm sorry a lot too. So does Hubby and the Kid. It's something we're taught as children … to apologize for a perceived misconduct or saying something that is taken wrong. And it's a hard habit to break. I do similar things! So I was poking around my followers today and found you. All this time I've been missing out on your blog! I read a couple of your posts and you are the kind of person I want to be friends with! Let's be friends! 🙂 I look forward to reading your blog. Congrats on all your success, you look amazing! So weird how our minds see ourselves…you are such a tiny person, I can't imagine you feeling like you take up so much space. I'm glad you see this and are working on it. You are still growing through this process and it's both fascinating and inspiring to watch you unfold! I so identified with your apologizing and trying to take up less space in the presence of some people. For those of us who grew up with weight issues, the inadequacy we so often felt was internalized, and old habits and feelings die hard. But Lynn–you are thin, lovely, talented, and so equal to everyone else you would ever meet–and there's no need to hide who you are. My biggest wish growing up was to be invisible. What a transformation… that now you are embracing who you are, not apologizing, and growing in strength and confidence in who you are. This piece, Lynn, made me cry. It was like you were describing me! And I think apologizing and trying to 'shrink' in the world has lead to a LOT of my eating problems. Thank you for opening up my eyes and my heart today. I've been reading your blog faithfully for 6+ months now. What I've seen is a very sincere, kind person. And you are beautiful! You know, I posted a picture the other day (among friends) and they all commented on how beautiful I am. HA! All I saw was wrinkles and a pretty fat nose. Be mindful Lynn. You are a gift to yourself, your family, your friends, and even those you don't know personally but come in contact with out and about each day. I had a life lesson today at the grocery store. A native Elder passed by me and I smiled at him. He said, “you need to always smile.” I nodded and said thank you. He said, “I'm a Chief in Venetie, (village in AK) and I've been married to my wife for 54 years. You know why? Because she smiles at me ALL the time.” – good lesson. Now go smile at yourself in the mirror. Right NOW young lady! While the emotions you describe are your own, many of us have felt the same way. If I could have pick one word to describe how I saw myself in highschool it would be invisible. That wasn't how others perceived me, just how I perceived myself. I still struggle with that. I truly expect people I've met, even if I know them pretty well not to remember me – after all, why would you remember the invisible girl's name? After reading your blog and thinking. I realize I apologize a lot too. So much that one day one of my patients said, will you stop saying “Sorry” you're doing your job. I think it is second nature for me. Oh yes!! Here is to you flowering and expanding to live fully in your own space! Wow, I didn't expect this to strike such a chord with people, both apologizing and wanting to be invisible. As always, you continue to teach me just how deep and vast weight issues permeate our lives. Thanks for posting about this – I do that so much. Retreat, shrink back, say no to things where I might have to speak out. I sleep in a little part of the bed too – even though I have the whole King size one to stretch out in! I'm working on learning to be present in all my physical sense. And its good to feel like I am really part of the world and not a cypher, or an afterthought, or a non-entity because I am obese. You are so vibrant, I'm sorry you still have feelings of wanting to hide! Is it any surprise as “Invisible Girl” that I can relate. I think I was the most uncomfortable after the weight came off…I had to just learn to be happy with the space that I held…no more weight to hide beneath. I think it is good though to examine these things…growt comes from that squirmy place. Good job at recognizing it – and you look fabulous!